For most people, the screen of a cell phone is the first thing they see in the morning and the last thing they see before going to bed. Nobody can deny the fact that living without a cell phone today is extremely difficult but must we be so glued to them? Staring into a phone or tablet screen, before going to sleep affects your sleep as well as impacts your health. It is harder to fall asleep - We feel sleepy when the brain releases a hormone called melatonin. This release is determined by the body's circadian rhythm which is controlled by light exposure. The blue light of a cell phone screen interferes with this rhythm and tells the brain not to secrete melatonin. This makes it harder to fall asleep even after you have switched off your phone. It hampers the quality of your sleep - A direct effect of sleeping late is a reduced amount of sleep. 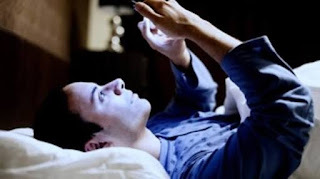 On top, that, using a cell phone before going to bed also hampers the quality of your sleep. When an office email or a text message is the last thing you see before going to sleep, your brain cannot completely shut off. This makes you tense even in your sleep. It lowers your attention span - When you wake up from a restless night's sleep, your productivity suffers. Not getting enough sleep is known to hamper your decision-making skills, impairs both long term and short term memory and make you distracted. This leads to unnecessary stress and anxiety. It increases the risk of weight gain - The body is more likely to feel hungry when you don't have enough sleep. This is because sleep-deprived people have a lower metabolism. Thus using a cell phone before sleeping also increases your chances of snacking on something unhealthy to get through the day and in turn you put on weight. It weakens your immune system - The body's immune system produces antibodies that fight infections while we are asleep. Depriving the body of the sleep it needs weakens the immune system by not giving it enough time to build its forces. Not only does this increase the risk of falling ill it also slows down recovery from illnesses. It damages your skin - Sleeping late at night and not getting enough sleep can cause dark circles, puffy eyes and fine lines across the face. The blue light of a cell phone screen also tells the body to secrete cortisol which makes the skin less elastic and smooth. Thus, even if you look at a phone screen for just five minutes every night before going to bed, the side effects last much longer and affect your mental and physical health as well as your looks. Related Tip: How Badly Sleeping Postures Can Affect Your Spine and Ways to Undo It?